Various state and federal laws have requirements aimed at making education accessible to as many people as possible. For instance, making sure that classrooms are wheelchair accessible would be an effort to comply with these laws and policies. Online classes need to be accessible as well. This document outlines some general best practices when designing a course for accessibility concerns. Additional help can be found at Creating Accessible Electronic Content. Specific Canvas-related accessibility help can found in the Accessibility within Canvas document. If you have additional suggestions, please contact accessibility@instructure.com. Generally, the layout of a page should be simple, clean, and uncluttered. Navigation should be clear and consistent from page to page. When adding content, keep content organized and chunked together in short paragraphs so users can scan your content easily. Headings should always include descriptive section headings. Section headings allow for a quick scan of the content for sighted and non-sighted users. In Canvas, page titles are automatically generated at H1. Alternative (alt) text is required to provide a textual alternative to non-text content in web pages. This text will be read aloud to a person using a screen reader. By default, Canvas includes the image name as the alt text, which should be changed to something more descriptive when embedding images. Alt text is not the same as the image title, which generates text when users hover over the image. Learn how to embed images in the Rich Content Editor. 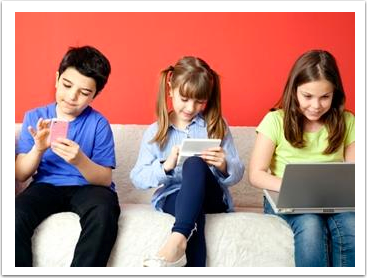 Modified Alt Text: one boy and two girls sitting on a couch with a smartphone, tablet, and laptop. When adding a link, instead of pasting in the URL directly, attach the link to words that describe the link destination. This behavior will help everyone (whether they are screen reader users or not) understand where the link will take them. "Donald Tapscott, in his paper ''Growing Up Digital," http://www.ncsu.edu/meridian/jan98/feat_6/digital.html says these students..."
"Donald Tapscott, in his paper ''Growing Up Digital," says these students..."
Users can view text contrast well when formatting with bold and italics, which help distinguish between important content items. Tables should be used for data display, not layout. Headings should always be included for columns and rows. In Canvas, headings for table columns and rows can be changed in the Rich Content Editor. View the Creating Accessible Tables in the Rich Content Editor. Videos should always have the option to view captions. For external videos, check with the video provider for caption availability. Learn how to Caption YouTube Videos owned by you. For videos created or uploaded into Canvas, Canvas uses a tool called Amara to sync your script with a video. Learn how to create captions for new or uploaded Canvas videos. There may be times an instructor wants to deliver content in other file formats not native to Canvas. Here are tips to ensure accessibility of some of the most popular file formats. General accessibility guidelines apply to designing a Word document. General accessibility guidelines apply when designing a PowerPoint document. Use the built-in accessibility checker: [File > info > check for issues > check for accessibility]. Use slide layout templates whenever possible. When you can’t use a template, use one with the slide title only. Write presenter’s notes in the provided area. Apply ALT text to images. Add captions to the slide or presenter’s notes for complicated images (e.g. diagrams or maps). If embedding video, caption the video and ensure the player controls are accessible. If embedding audio, include a transcript. Portable Document Format (PDFs) should be created as accessible documents. Most commonly, PDFs are created from Word documents. If you do not have the original source file for a PDF document, you can tag the PDF to help with accessibility. The default color for links within Canvas did not pass accessibility color checks with the white background, so I'm having to go through and change link color to the darker and accessible color called indigo. Is this a possible correction that could be made for the default settings for all Canvas users? Same goes for the default sizing of the font, it is too small so we are always having to enlarge the font on everything entered into Canvas. Re: Accessibility is a broad topic! Would someone summarize this for us? Re: Is Accessibility hurting Attendance?